LEXINGTON, Ky. (April 25, 2013) – The 2013 University of Kentucky Provost's Outstanding Teaching Awards go to three tenured faculty members, two lecturers and six teaching assistants. The award recognizes faculty and graduate teaching assistants who demonstrate special dedication and outstanding performance in the classroom or laboratory. Recipients are selected via nomination and review by a selection committee based in the Provost's Office of Faculty Advancement. Chana Akins, associate professor in the Department of Psychology in the College of Arts and Sciences. She received her doctorate in experimental psychology at the University of Texas in 1994, came to UK as a postdoctoral fellow, and two years later joined the UK faculty. Akins' research interests are substance abuse and motivated behaviors. She has mentored many undergraduate and graduate students in her laboratory where they gained intensive experience in basic behavioral research. Judy Goldsmith, professor in the Department of Computer Science in the College of Engineering. She received her doctorate in mathematics at the University of Wisconsin in 1988 and has been on the computer science faculty at UK since 1991. Her major research interests include computational decision making, which she describes as, “computers making decisions and computers helping people make decisions.” Goldsmith also is interested in using models for planning under uncertainty to develop decision support systems and decision aids. Currently, she is working on a decision aid for rheumatoid arthritis patients. She has advised many undergraduate and graduate students in research projects. Matthew Zook, associate professor and director of Graduate Studies in the Department of Geography in the College of Arts and Sciences. He earned his doctorate from the University of California at Berkeley in 2001 and joined the geography faculty in 2002. Zook is an economic geographer and researches the geoweb and how people use mobile, digital technologies to navigate through the digitally augmented places that cities are becoming. Jeffrey Ashley Jr., a lecturer in the Department of Electrical and Computer Engineering in the College of Engineering. He received his bachelor's, master's and doctoral degrees from UK. In 2012, Ashley received the Henry Mason Lutes Award, which recognizes and rewards outstanding teaching accomplishments in the College of Engineering. Additionally, he has won the Department of Electrical and Computer Engineering’s Outstanding Teacher Award as determined by the student body of the department every year since 2007 when he became a lecturer. Kim Woodrum, a senior lecturer in the Department of Chemistry in the College of Arts and Sciences. She received both her bachelor's degree and doctorate in chemistry from UK. As a student, her field of study was inorganic chemistry. Her research interests are in the field of chemical education, including chemist textbook authorship. She has taught general chemistry at UK since 1994 and is one of the most popular chemistry instructors in the department. Christopher Grosh, in the Department of Anthropology in the College of Arts and Sciences. He received his bachelor's degree in anthropology from the University of Kansas in 2010 and is working on a doctorate at UK. As a biological anthropologist, Grosh's research interests include human adaptability, with a focused interest in the nutritional health issues facing refugee populations during their resettlement process in the U.S.
Sema Gunturkun, in the Department of Mathematics in the College of Arts and Sciences. She has bachelor's and master's degrees from the Middle East Technical University in Turkey and is working toward her doctorate at UK. Her research interest is in commutative algebra and focuses on Gorenstein Ideals of codimension four. She has taught Calculus I,II, and III as a teaching assistant at UK. Mary Clai Jones, in the Department of English in the College of Arts and Sciences. Her bachelor's and master's degrees in English are from Appalachian State University and she is pursuing her doctorate at UK. Jones' research interests are in gender and women's studies and 19th century British literature. Her dissertation project examines how female characters in Victorian fiction use cosmetics, clothing and dolls to access spaces to which they are not normally granted access. Grace Martin, in the Department of Hispanic Studies in the College of Arts and Sciences. She has bachelor's degrees in Spanish and vocal music from Morehead State University and is working on her doctorate in Hispanic Studies at UK. Martin's research interests are Latin American science fiction, film and pop culture, as well as gender and sexuality studies. She integrates pop culture and social media into her classes to engage students. Radu Paul Mihail, in the Department of Computer Science in the College of Engineering. Mihail is currently teaching a course he originally proposed on graphics programming for computer games. Mihail was the first-ever Halcomb Fellow in Medicine and Engineering. He was awarded up to $50,000 toward developing an interactive decision aid for patients with rheumatoid arthritis, a project he has been working on with Professor Judy Goldsmith as one of her doctoral students. Carrie Mott, in the Department of Geography in the College of Arts and Sciences. She has a bachelor's degree in religious studies from the University of Oregon, a master's degree from the University of Arizona in Near Eastern studies, and is a doctoral candidate in geography from UK. Her research interests include U.S.-Mexico border security and militarization on indigenous lands in Southern Arizona and indigenous solidarity activism. 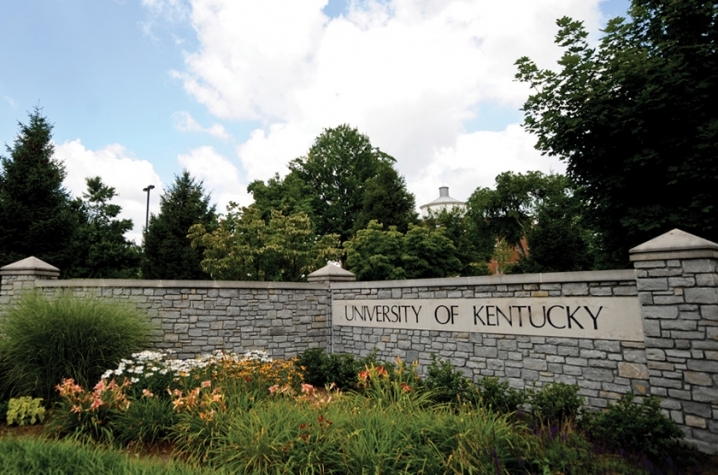 A reception for the honorees, hosted by UK Interim Provost Tim Tracy, is being held in the Main Building today, Thursday, April 25. For more information on the 2010 Outstanding Teachers Award, visit the Provost's Office for Faculty Advancement website.